Having a strong core, back, glutes and quads are also important for overall body mechanics. As the body ages, strength training improves balance and coordination; that in turn prevents falls that could lead to fracture so it’s never too late to start strength training. I started when I turned 40 and I workout with my mom who’s in her late 60’s; she squats as much as I can! My preference is to workout at the gym because it’s quick and efficient. However, when I can’t get to the gym, I modify my workouts with basic equipment that I have at home. It’s easy anyone can do this! Kids – use them as weights. They’ll love it. Before you begin, note that “Supersets” are when you have two different exercises. The second one is performed immediately after the first one without rest. After both exercises are performed, rest 60 seconds before repeating the set. Here’s the video for Standing Kick Backs. For Standing Abductor Lifts simply stand feet together with the resistance bands still around your ankles and lift leg up sideways. Our kids love to workout with us. My daughter weighs 65lbs. which is the perfect weight for what I had to accomplish. She sat on my shoulders with her feet hooked behind my back and held my hands for support. Perform each squat at a slow speed for max resistance. If you don’t have kids or they aren’t heavy enough, you can also substitute the Barbell Back Squat for Dumb Bell Squats. b. 10 Reps of Leg Press using Dumb Bells against the wall instead of the Leg Press Machine. b. 15 Reps of Leg Extensions; sit on a chair and use dumb bells, instead of using the Leg Extension Machine. Give this workout a try. Comment below, If you want to see more workouts modified so you can do them at home. 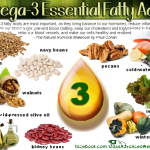 Are you getting enough Omega-3 Fatty Acids in your diet?